Ethereum is a new kind of law. Traditional law is a form of agreement. It is an agreement among people and their leaders as to how people should behave. There are also legal contracts between individuals. These contracts are a form of private law that applies to the participants. Both types of agreement are enforced by a government's legal system. For example, if you loan someone money and they don't pay you back, you might take them to court. In practice, this is messy and unpredictable. Court cases require expensive lawyers to argue about the law, are often measured in years and even if you "win", you have the problem of collecting. Hopefully you wrote down the terms of that loan as a contract. However, the authors of laws and the writers of contracts face a special kind of challenge. Ideally, there should never be any confusion about the meaning of the agreement. But laws are written with words, and words are famously imprecise. There is no greater impediment to the advancement of knowledge than the ambiguity of words. So these are big problems with traditional law. Agreements are ambiguous. And enforcement is hard. Ethereum solves both these problems. It does this with the marriage of two special ingredients: a digital currency, and a complete programming language. Let's look at both. 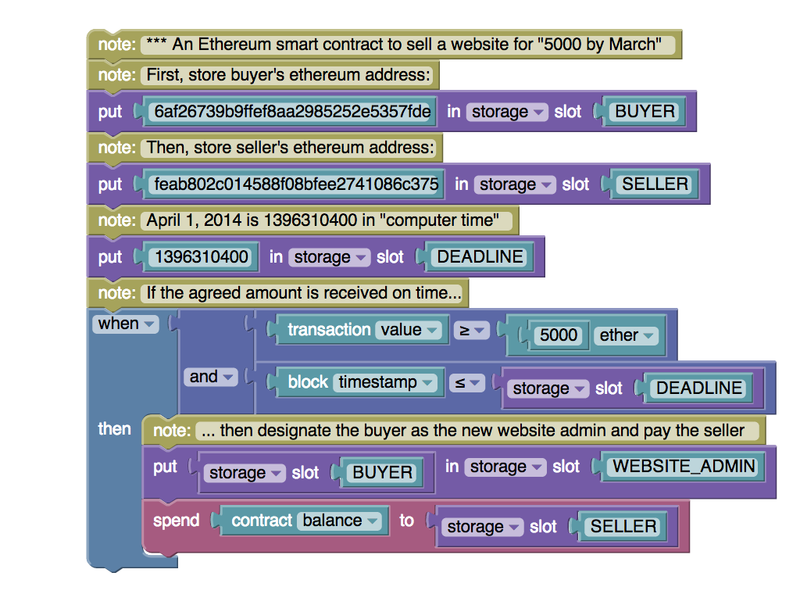 Ethereum’s other half is a complete programming language, sometimes called EtherScript. A programming language is how people tell computers what to do. Computers are not able to guess at what humans really intend, so instructions written in any programming language are precise. There is no ambiguity about how a computer will run a program. Under the same conditions, it will always run the same way. This feature would be great to have in legal contracts and human law. We can do this, actually, by writing such agreements in EtherScript. They only do what you tell them to. Since most agreements involve the exchange of economic value, or have economic consequences, we can implement whole categories of public and private law using Ethereum. An agreement involving transfer of value can be precisely defined and automatically enforced with the same script. Let’s look at an example. You’ve built a website and someone wants to buy it for $5000 but they can only pay in March. In the traditional approach, you transfer control of the website and write down what's been agreed on a piece of paper. March arrives and it seems there has been some confusion. You assumed the contract meant this March but they insist they meant next March. Get ready to argue in court about the meaning of “March”. Reading agreements in this form could take some getting used to, but no more than the legalese produced by today’s contract lawyers. Fill-in-the-blank scripts would likely become available for common uses. Specialists could craft very custom agreements, as done by lawyers today. In return, we eliminate “I thought, you thought” confusion and remove all uncertainty over whether the other person will follow through. The script both defines and enforces the agreement. It is essentially an unbreakable contract. This is a very powerful thing. As another example, organizations formed under traditional law can be formed using Ethereum instead. A corporation normally has Articles of Incorporation — a legal agreement which defines voting rights of the owners, powers and limitations of the CEO and so forth. This could be defined in EtherScript such that the CEO is elected by a 2/3 vote of the owners and that CEO can authorize use of funds up to a limit without owner majority approval. Initially, Ethereum law will find a natural fit to agreements where items of value are digital. Control of ether itself and other digital assets like websites, software, digital content, cloud storage and the like, could be enforced most directly. But, in time, this could naturally spread into the “real world”. For example, cars of the future could have ignitions that respond to a digital key. If the EtherScript lease agreement is breached, the car won't start. In a world where private and public law can be perfectly observed and enforced, a lot becomes possible. You might imagine a town defining all its local laws in EtherScript. New laws and modifications could only be made by a voting system defined by the town Charter, also written in EtherScript. Residents could have perfect certainty about how laws apply to them and how they are enforced when choosing to live there. You might even imagine a nation defined not by geography but by the rules and benefits of citizenship. Imagine that people of the future could opt-in to the virtual nation that suits them best. When viewed from the future, today’s current legal system seems downright primitive. We have law libraries — buildings filled with words that nobody reads and whose meaning is unclear, even to courts who enforce them arbitrarily. Our private contracts amount to vague personal promises and a mere hope they might be honored. For the first time, Ethereum offers an alternative. A new kind of law.